Check out Tobi's Joli Faux Patent Leather Bustier Top Sometimes all it takes is a simple top to look chic and edgy. Show your daring spirit with our Joli Black Faux Patent Leather Bustier Top. This stunning piece from Tobi flaunts a boned faux-leather bodice, back zipper closure, and adjustable straps. Match it with trendy trousers or denim jeans, white sneakers, and quirky jewelry and dazzle any crowd confidently. Sometimes all it takes is a simple top to look chic and edgy. 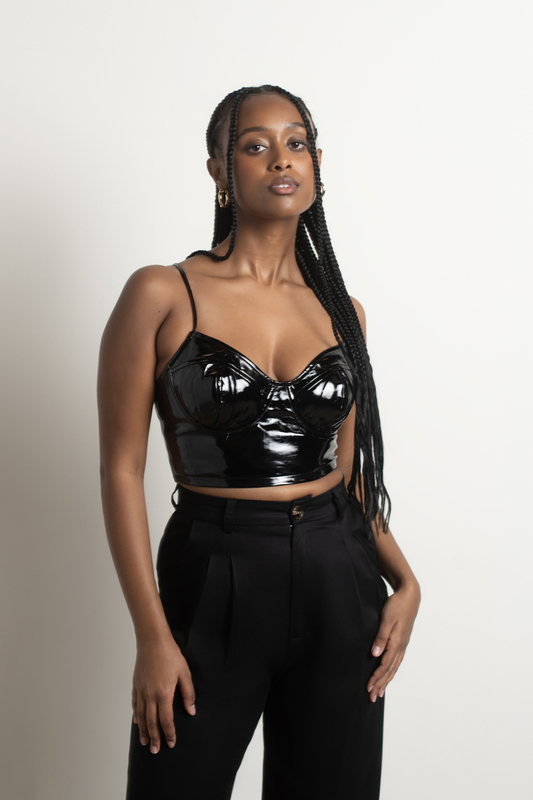 Show your daring spirit with our Joli Black Faux Patent Leather Bustier Top. This stunning piece from Tobi flaunts a boned faux-leather bodice, back zipper closure, and adjustable straps. Match it with trendy trousers or denim jeans, white sneakers, and quirky jewelry and dazzle any crowd confidently. Keep the faux leather smooth, shiny, and in good shape with proper washing and storage. Make sure you get the perfect fit for your size so you can look and feel wild and free.